Cake the detik Ice Queen!. Cake caught her crazy!. Wallpaper and background images in the adventure time with finn and jake club tagged: adventure time fionna cake second ice queen ice tiara. This adventure time with finn and jake fan art might contain anime, komik, manga, and kartun. Hahaha! LOL!!! 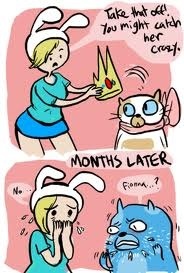 but why is Fionna FAT???? Um, Cake can't 'catch Ice Queen's crazy' because she already HAS magical powers. only humans are effected by the crowns more... evil powers.